Hey wait come back! I was only kidding about all the speakers and wires. Sure, a nice 5.1 or 7.1 setup will make your living room sound like a little movie theater, but it can also be an eyesore, or at the very least, difficult and expensive to set up. There's an easier way: buy a sound bar. A sound bar is a horizontal "bar" of speakers meant to sit right up under your TV. The right one can really make your TV shows, movies, video games, and music sound a whole lot better than they do coming out of your TV's speakers, and you can get a good one for less than $500--far less than a whole surround-sound getup. Before you whip out your credit card for the first deeply-discounted sound bar you find on sale, take note of these considerations. As with all audio gear, you don't have to spend a fortune, but you do need to take heed of certain considerations. Your sound bar is going to sit underneath your TV. Make sure there's room for it. If your TV is in an enclosure, pull out a tape measure and see how wide it is. See how much room you have in front of your TV. Check out deep your TV stand or enclosure is--if you buy a pedestal-style sound bar, you'll need to know the depth. Nothing would be worse than unboxing your new sound bar at home only to find it doesn't quite fit where your TV is. Take note of what your TV looks like, too. You don't have to get a sound bar that exactly matches your TV's looks, but it helps the sound bar "disappear" if it doesn't clash terribly with your existing equipment. 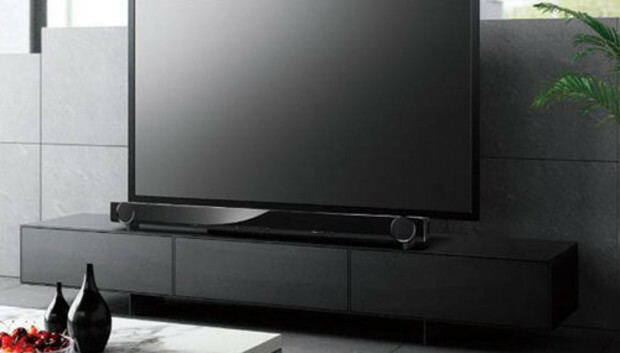 Some HDTV makers also make sound bars, and they're made to match the aesthetics of their TV lines. You don't really need to match this closely if you don't want to, but the option is there. Use your smartphone to take a few photos of your TV as it sits in your living room. Some from far away, some up close. Make sure the room is well-lit. That way, when you're looking around in the store, you can refer to your living room setup and get an idea of what it's going to look like in there. There are really two types of sound bars. One is a traditional "bar" a few inches tall and a few inches deep, that sits below your TV, in front of the TV's stand. Pedestal-style sound bars are typically a foot or more deep, made to be a platform upon which your HDTV rests. You'll want to make sure there's room for your TV to be lifted up a few extra inches, but pedestal sound bars have some nice advantages. Because of their larger size, they often have enough room for good low-frequency speakers, and don't need a subwoofer. They also integrate nicely into most entertainment centers, making them harder to notice, especially if your entertainment center is black. Unless you buy a larger pedestal-style sound bar, do not get one without a subwoofer. A subwoofer is a speaker dedicated to low frequencies, and is absolutely essential to making sure your music has good bottom end, and your movies have good "boom" when things go "boom" on screen. I know, I know: the whole point of buying a sound bar was to avoid all the extra speakers and wires. But we're only talking one extra wire, and you can put the speaker almost anywhere in the room. Low-frequency sounds, by their very nature, are hard to pinpoint the location of. So you can plop that subwoofer by a plant in the corner and discreetly run the speaker wire along the baseboard to it, and nobody will be the wiser. Imagine: You go into your living room, and decide you want to listen to some music while you have your morning coffee and check your email. But all your music is on your phone. Maybe you like to use Pandora or Spotify. So you pull out your phone, press a button on the sound bar's remote to flip it over to Bluetooth input, and like magic the music that would be coming out of your phone is coming out of your sound bar. Criminally, not every sound bar supports Bluetooth. You want to make sure the one you buy does. Streaming music from your phone or tablet is just too convenient, and it's really easy to pair it with your sound bar. Inputs? We don't need no stinkin' inputs! Some sound bars have HDMI inputs and output and passthroughs and analog audio jacks and... it's like the Hair Club for Men with all the plugs back there. You probably don't need all that. You really need a minimum of inputs. First, look at your HDTV's manual, or dig around behind it. Almost all HDTVs have a digital optical audio output. Buy a sound bar with a digital optical audio input, and just run the audio from your TV to the sound bar. That way anything on your TV, no matter what input it comes in from (cable box, blu-ray player, game console...) will play through the sound bar. Some TVs only have analog audio outputs, which is less ideal, but can still work well and will still give you better sound than sticking with your TV speakers. Be sure to go into your TV settings and disable your HDTV's internal speakers, too. You don't want sound coming out of the sound bar and your crummy TV speakers! Some sound bars promise surround sound. It's a lie. The only way to really, truly get the sensation of sound coming from behind you is to actually put speakers behind you, which sort of defeats the point of a sound bar. Having said that, some of the "surround" modes on sound bars can give you a wider sound stage and will seem to fill the room better than regular stereo mode. The quality of the surround features on sound bars is all over the map. It often depends on the layout and shape of your living room, and the type of content you're playing. As a rule, I would say not to bother with surround modes unless you can listen to the exact sound bar you're considering in a store, with the content of your choosing, and you think it really does sound good. You don't have to avoid sound bars with surround modes--they all play in regular stereo just fine--but don't feel like you have to go out of your way to get this particular feature. Now you know what you need in a sound bar. It has to fit the space, has to have Bluetooth support, has to have a subwoofer (unless it's a larger pedestal-style bar), doesn't need a ton of inputs, and doesn't need fancy surround sound modes. Only one major consideration remains: price. There are good sound bars that cost less than $500, but not many really good ones for less than $200. Everyone has a different budget, but that that range should provide some guidance. You can spend well over $1000 on a sound bar, but in that price range, you're almost certainly paying for frills that may be nice to have, but are hardly necessary.